Did you know that the meteorological start to fall lands on September 1st? 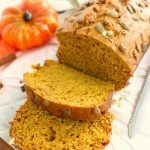 I know its still a couple weeks away, but that is just one more reason to call an end to the heat sweltering days of summer, usher in the crisp, colorful days of fall and mix up a batch of my delightful Fall Favorite Pumpkin Bread. Without a doubt, fall is my absolute favorite season – college football, cooler weather, soup and stew for dinner, back to school, and pumpkin bread – all of these things make me so happy and provide such a feeling of warmth, security, friends and family. What better way to celebrate the meteorological start to fall that making Pumpkin Bread? When September 1st rolls around, I am usually the first in line to get a Starbucks Pumpkin Spice Latte, and a slice of their pumpkin loaf. (Although, last year my friend Rachel somehow found a way to get herself one of these coveted drinks the last week of August!! My sweet, Brit friend is such a smarty pants!) However, $6+ gone out of my wallet, and who knows how many calories later, it proves to be something that I just cannot justify every other day. When Starbucks first started introducing their Pumpkin Loaf several years ago, I quick fell in love with the treat. 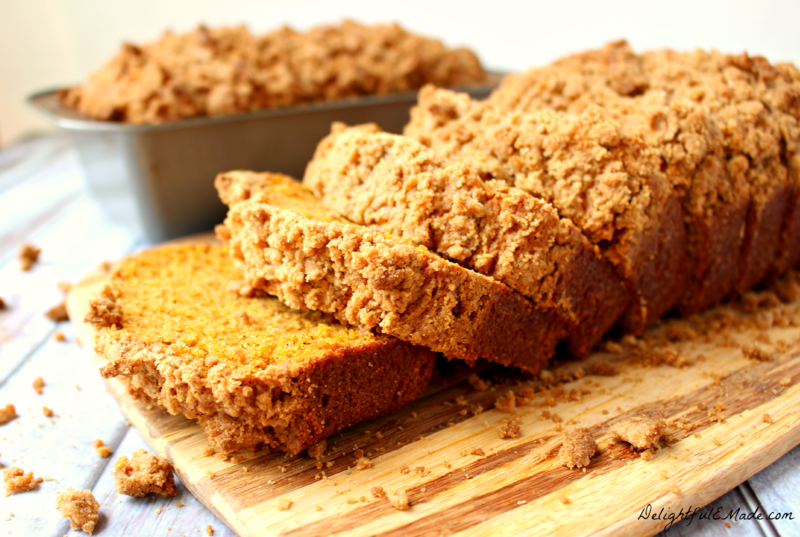 I went on a quest to find a recipe that mimics the moist, flavorful quick bread. Several tried (and failed!) 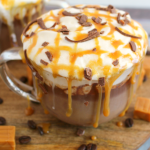 recipes and adaptations later, I found a recipe that holds true to the Starbucks favorite. 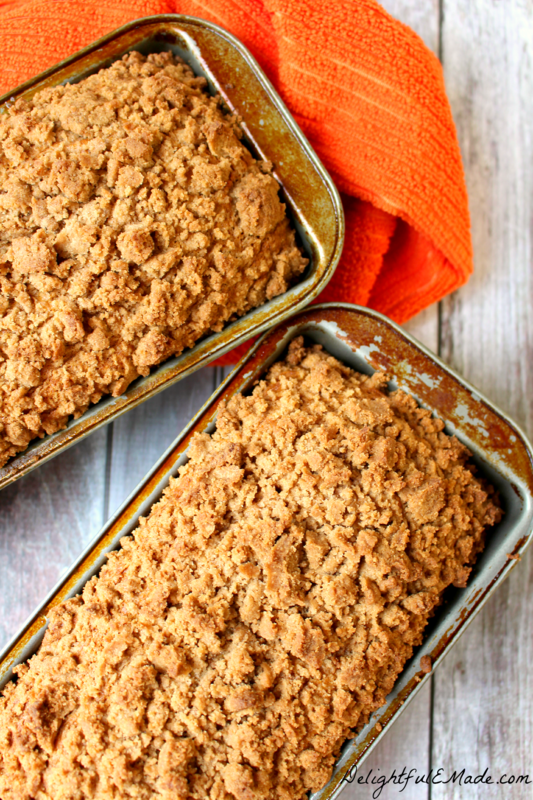 Over the years, I started adding a Struessel/crumble topping, as its a great addition to the moist, sweet bread below. I’ve been making this Pumpkin Bread recipe for several years now, and it always makes your house smell amazing as it bakes. Once it comes out of the pan, you’ll want to slice into it right away, as the aroma is sweet, comforting and makes you want to bite into a slice immediately! Many of my friends, neighbors, parents and teachers at my son’s school have been recipients of this treat. 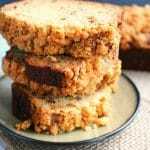 The recipe makes two loaves – one for you and one to take to a friend, or pop in the freezer for later. 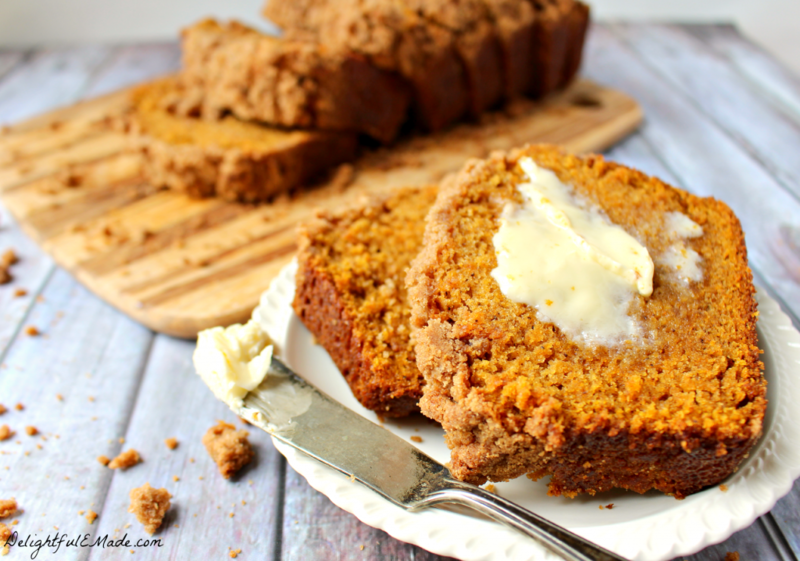 This Fall Favorite Pumpkin Bread is perfect for breakfast or a snack any time of day. 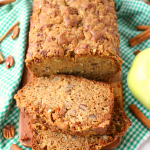 This moist delicious bread is perfect to celebrate Fall! Spray two 9x5x3 loaf pans with non-stick baking spray. With stand mixer (or hand mixer), combine sugar, oil, pumpkin and eggs until smooth. Set aside. In separate bowl, combine dry ingredients: flour, cloves, cinnamon, nutmeg, soda, salt and baking powder. Sift or use whisk to ensure there are no lumps and everything is nicely combined. Gradually add dry ingredients to your wet pumpkin mixture. Mix until everything is combine. Divide batter equally to the two prepared pans. Bake until tester (toothpick) inserted comes out clean, approximately 57-60 minutes. When done, transfer to cooling rack. Run a knife around the edges, and turn the loaves out of the pans to cool completely. 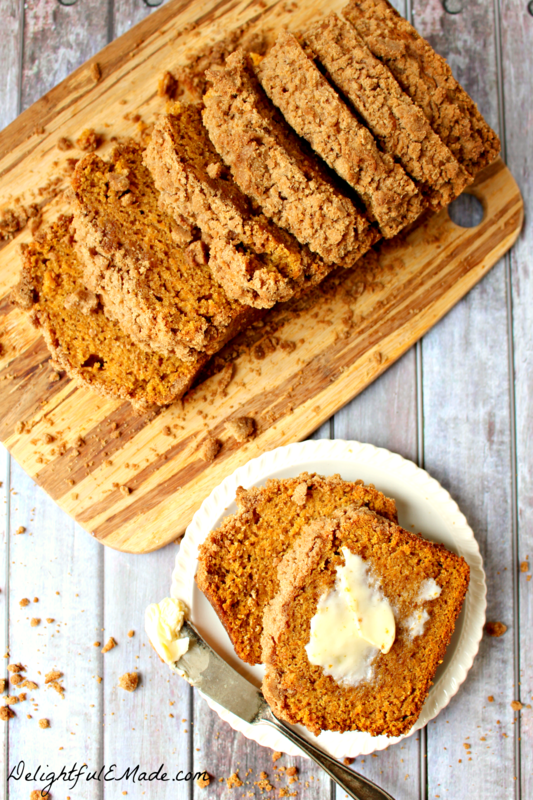 As you can see, this delicious Pumpkin Bread is pretty easy and straight-forward to make. 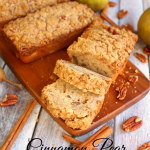 I hope you enjoy your upcoming fall days with a slice of this perfect fall treat. This pumpkin bread looks wonderful Erin! I have not started any fall baking yet but will be soon! I love pumpkin but I've never tried pumpkin bread. I would love to try this! Thanks for sharing it at the Less laundry, More Linking party. What a lovely bread, Erin! I enjoy making a sour cream pumpkin bread. I made two loaves yesterday but unfortunately, I didn't bake them long enough (I was busy last night and wasn't thinking) so the sunk in but they still taste delicious! And they are super moist. I'm loving how perfect yours turned out! Now I'm off to check out that slow cooker chili recipe of yours. YUM! 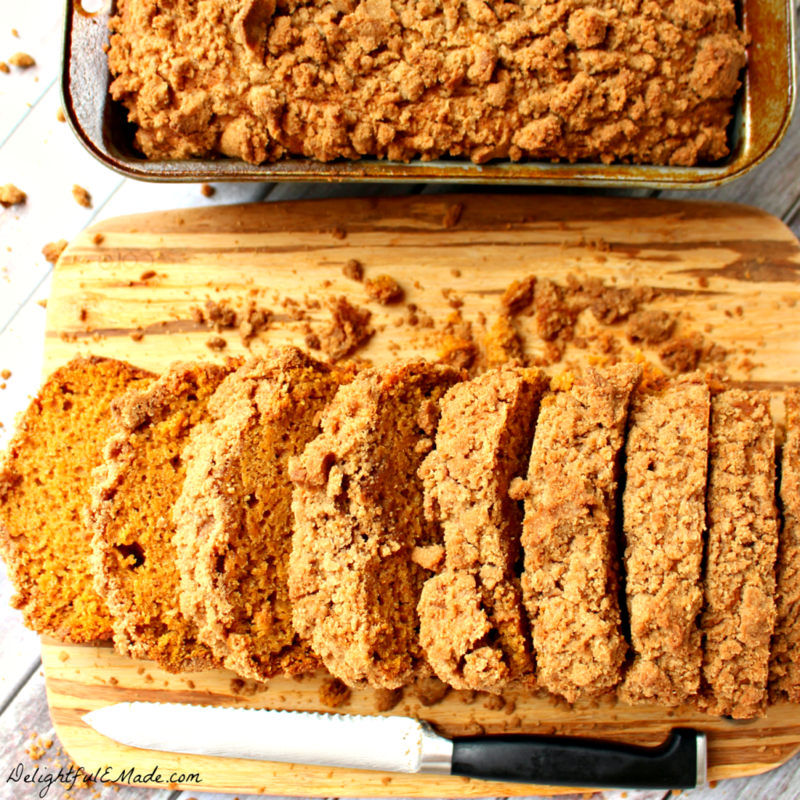 This is one great looking pumpkin bread! So moist and full of flavor. Just found this on Pinterest and will be making it today!!! Can't wait! I had made some fresh pumpkin purée a couple days ago, and I only had about a cup remaining. After coming across your recipe, I decided to half it, and make one loaf. My entire house smelled awesome as it was baking, and the bread turned out great! Thank you for the recipe! So glad you enjoyed it, Amy! Looks fabulous! 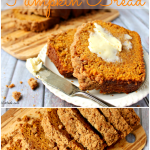 Am going to make your Pumpkin Loaf right now! Thank you! You'll love it, Cynthia! Enjoy! Realized I had everything to make this after dinner tonight. Turned out amazing. So good! Thank you! Hi. This looks delish! I plan on making it for my sons school but was wondering what the instructions were for the optional topping. Do you just take all of the ingredients and mix it together then Sprinkle ontop? Oh my, this looks so good. I'll be putting a can of pumpkin to use on this scrumptious looking loaf. Stopping by from The Weekend Re-treat. 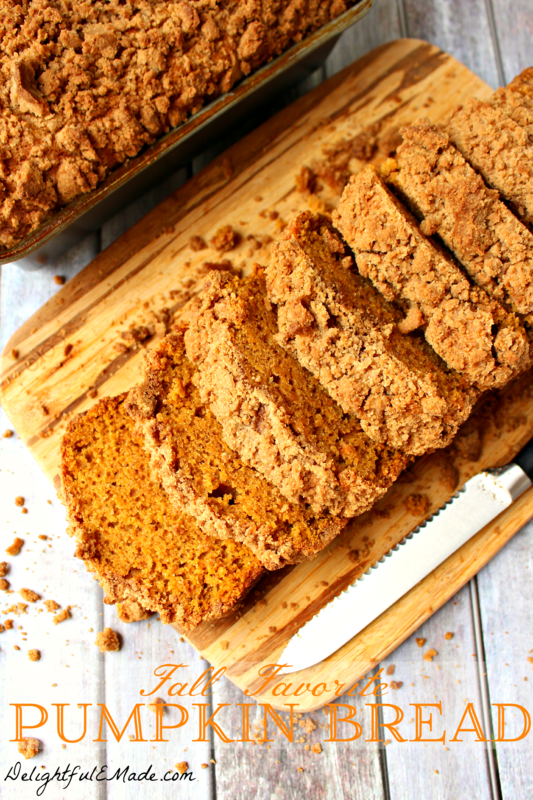 Sad to see pumpkin recipes because that means fall is on its way...but I do love this recipe! Another gorgeous picture! :) Thanks again for linking this with us! This looks really beautiful! I just wish I liked that way pumpkin tasted :( But I supposed I can do bananas with it :) Thanks for partying with us this week at #FoodieFridays!!! 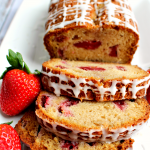 We are always glad to see your recipes on there! See you again this week!